Research Methods 1 Edition At last, a fresh approach to the research methods course. With 20+ years experience teaching the course, Michael Passer knows what students understand and where they struggle. 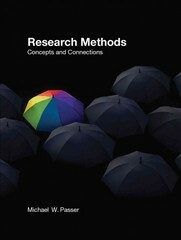 His highly anticipated new book, Research Methods: Concepts and Connections, offers students clear and compelling explanations and examples drawn from cutting-edge research from across the subfields of psychology. Readers come away with an unparalleled understanding of behavioral research practice in today’s world and how those skills apply to everyday life.